If wishes were real things you could spend like money, what would you wish for? Karou’s friends don’t believe that her blue hair grows naturally, but it does, because of a wish she got for her birthday. She was raised by strange creatures she calls monsters that are part human and parts of lots of other animals. Brimestone’s shop, full of teeth from all kinds of creatures, is where she learned to read and write and play. She’s been sent to school all over the world through the strange shop door that opens to different cities every time she leaves it. For high school, she’s been attending an art school in beautiful Prague and living her life as mysteriously as she can while maintaining a few good friends. Things are nice and as normal as they can be for her- until the day she meets an angry angel on the streets who she soon learns is out to destroy her family and the life she knows behind the shop’s doors. What she doesn’t realize is how much has been hidden from her about the lives of her monster friends, and how important she will be in the dangerous battle that is looming between angels and devils. Laini Taylor weaves an incredible tale of heartbreak and beauty and life and death. Her words will make you want to visit Prague and peak in to alleyways to see if her characters are real. 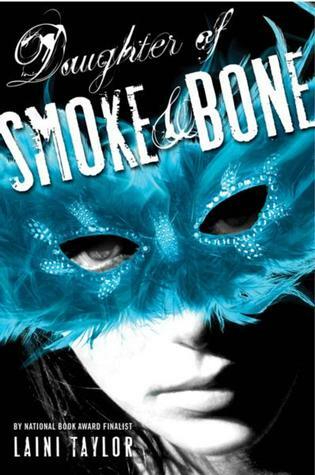 This book is great for anyone who likes supernatural romances and strong female characters. Bonus: it’s the first in a trilogy and you will not want to miss the other two books! Imagine a world where there are not only regular animals and humans, but brightly colored monster animals and humans that are vicious and beautiful and can compel you to do anything they want you to do? This is the world where Fire lives, and she is one of these monster humans, with hair all shades of reds and pinks and beauty so stunning that men and woman alike will do unreasonable things, like try to kiss her or kill her on sight. Fire has always hated her abilities, but she is the only monster human left ever since her greedy and scheming father, Cansrel, killed himself. Monster human blood attracts monster animals, and so she is in constant danger of attacks- the only thing that saves her is her ability to manipulate creature’s minds, which is something her father delighted in but she has always felt made her a terrible person. When mysterious attacks by blank-minded men make her home estate an unsafe place, she happily takes the invitation to visit the King’s city, even though it means having a constant steel-minded guard with her and trusting herself to the sullen younger brother of the king, Prince Brigan. The dangers are many and the longer she is away from home the more mysteries present themselves. Can she help a kingdom that is quickly falling apart, a good king who cannot control himself around her, and a damaged prince who seems to be the only one to understand her? Once again, this author does a wonderful job of world building. 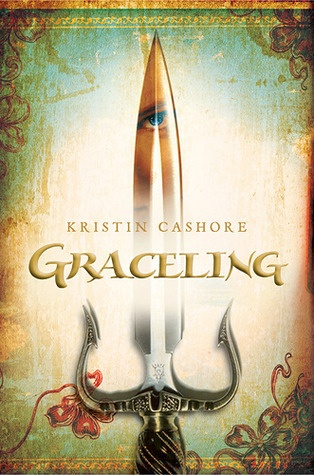 This book is part of the Graceling series but is set in a land that knows nothing of the Graceling-filled kingdoms, separated from them by a treacherous mountain range. 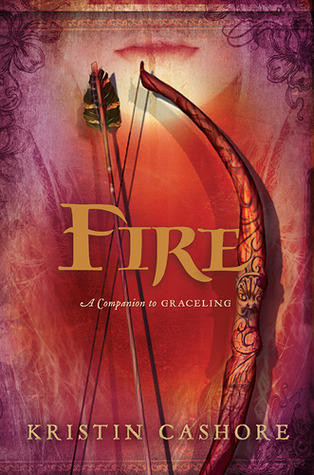 You do not need to read Graceling in order to understand the story- Fire actually takes place before Graceling and is considered a companion novel. Fantasy lovers, you will not be dissapointed! In the land where this story is set, there are humans that are Graced with special abilities, and they are clearly marked by having two differently colored eyes. In most kingdoms, the Graced are bound by law to be given to the kings as soon as their Grace shows itself. Katsa has always known herself to be Graced with the art of fighting, and as the niece of King Randa she was close enough to the crown when this was discovered that she was immediately put to work as one of his thugs. She hated to be used by him in this way, so she started a Council of trustworthy people throughout the kingdoms that secretly work against the ignorant kings and lords. Despite Katsa’s good heart and selflessness, her general distrust only allows a very small circle of people close to her heart. When the Graced prince from a local kingdom comes to her court in order to solve the mystery of his missing Grandfather, Katsa cannot decide whether or not to trust him- especially because he is the first man to ever get under her skin. If you have ever been a lover of fantasy, you simply MUST pick up this title. The world that the author builds is dazzling and intriguing, and the mysteries that Katsa works to solve will have you guessing until the last pages. This is also a great pick for anyone who likes to read about strong, independent female characters! Once you read this, you will be excited to know that there are two more books set in this world- Fire and Bitterblue. Lady Sybella is now a trained assassin of the convent of St. Mortain, and is undercover as the girl she would have grown up to be in her noble father’s household. While she pretends to be the aloof, cruel offspring of one of the most disturbed nobles alive, Count D’albret, she is secretly passing every minute waiting for the chance to slay this evil man who raised her. When she gets an assignment from the convent of St. Mortain to free D’albret’s prisoner, an ally of the Duchess who is being held for torture and agonizing death, she is accidentally whisked away with him and must learn how to navigate a countryside riddled with her father’s men and their other enemies, the French. Can they survive until they reach the young Duchess of Brittany and carry out a plan to overthrow D’albret? And why is this strong, fiercely loyal prisoner getting under her skin the way no man ever has? 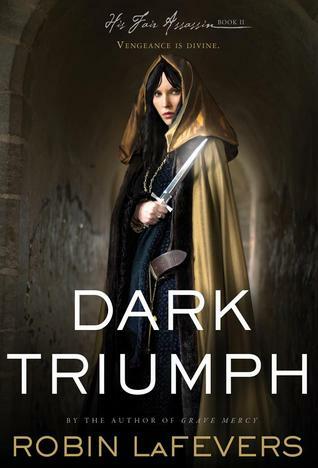 If you loved Grave Mercy, you will love Dark Triumph. This book is a whirlwind of adventure, intrigue, romance, and historical fiction with a twist. Sybella’s character is very different from that of Ismae, who is the subject of Grave Mercy, so those who may have thought Ismae’s story was not quite exciting enough will probably still want to pick this up. A great read! Ismae has grown up with a horrible father and is about to be married to an equally horrible suitor. On her wedding night, as she is about to suffer the first of her new husband’s abuse, she escapes and is aided in her getaway by a hedge priest. 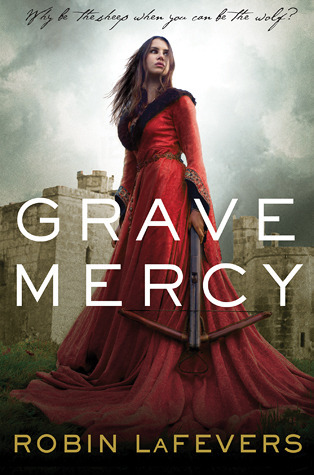 Soon enough she finds herself recovering in a remote convent where she is told her destiny, should she choose to believe it: she is the daughter of the god of death, Mortain, and her life’s work shall be to assassinate those whose evil acts mark them for murder. After months of training in the arts of poison, knife-wielding, and seduction, Ismae is implanted in one of the high courts of Brittany to protect the young duchess Anne and dispose of anyone she sees that is marked for death. This is a difficult enough task for a common girl who now has to pretend to be a member of the royal court, but things get terribly complicated when she reluctantly falls in love with a man who has been clearly marked. There are rules against love for the daughters of Mortain- especially if the object of their affection is also the object of their deadly arts. This book was simply captivating. Historical fiction isn’t always for everyone, but the supernatural element that exists makes it a good sell to any fantasy fan. The details that the author has written of the convent are dark and fascinating, while most of the information about the royal court and the treachery against Anne is based on fact! Hand this to anyone who loves fantasy, history, supernatural mysteries, and romance! Also, keep an eye out for the sequel released earlier this month, which tells the story of Ismae’s friend Sybella who is another of the daughters of Mortain.